There are many reasons why people came here fifteen or twenty years ago - they were adventurous, they liked the countryside, they'd learnt English and wanted to get even better at it, Scotland looked like a better bet for a hill walking enthusiast than say Holland! More often than not, they simply fell in love during a gap year or study break and by definition one of the two then needs to move country but quite frankly your French doctor, your German university lecturer, your Dutch dentist, your Danish IT and linguistics consultant did not come here for a 'better life' - in fact many of them chose to sacrifice a better future, a better pension, a warmer climate, a higher salary or whatever to be with their soulmate, and they aren't battling for their rights so they aren't sent home to some squalid existence! They came here not as immigrants but as Europeans exercising their right to work freely across the EU. 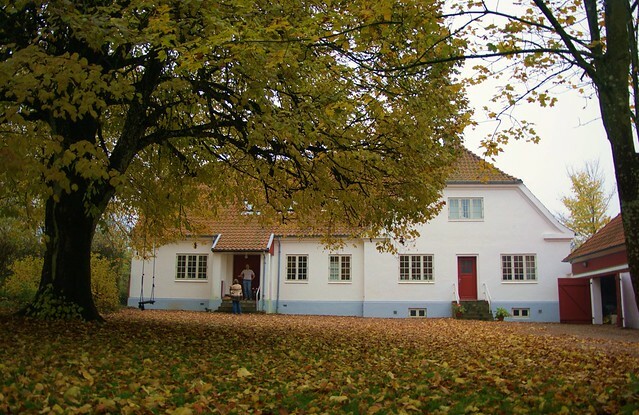 This is a photo of Thomas standing on the steps of the house where he grew up in Denmark. Is his Newton Mearns 60s-build really a 'better life'? Seriously? What they are really upset about is the moving of the goalposts. When Thomas moved here it was with the knowledge that if one day his parents were sick or elderly he could take them in, if that looked like the best bet. But now that right has been cancelled. He moved here knowing that should a relative be diagnosed with cancer, he was fully at liberty to take a sabbatical and care for them - now there's a time-limit on that - if he stays away for six months, he automatically loses his right to return to the country where his children hold citizenship and are being educated. He moved knowing he was able to take jobs where he was sent abroad to lecture or similar - again that is now a no no. He can't even try out a new job abroad with a six month trial period with a view to moving away without losing his right to return. He married a UK citizen also knowing that I could follow him, should we decide to move abroad either for work or retirement. I am about to have my freedom of movement forcibly removed. He chose to move within the EU and not outwith it because of freedom of movement. Even if he is granted the right to stay, he loses the rights above and quite frankly, had the UK been outside the EU in 2001, he would not even have applied for a job here. What people like us want isn't the right to remain - it is the right to keep the rights that were in place when we decided that this was a viable place to have a family, buy a house and settle down. Nothing more, nothing less. I am so sorry for your plight and understandable anger and frustration. My son is in your position only in Slovakia 🇸🇰He has no idea what is happening and because he has married a Slovakian girl they can't automatically return here. It truly is a sorry mess and all brought about because a political party had internal differences. Although we now live in Scotland my husband had an operation in the London Heart Hospital. Without " immigrants " he would be dead. Hospitals, transport, farming, University research......... I've no idea how they will be sustainable without "immigrants"! And now there is talk of Empire2? What is going on? And to add to our joys.. Trump in the White House. Good Luck, we'll all need.